So another holiday season has came and went — maybe some went more smoothly than others. If you got a loved one’s size wrong when it comes to rings, or if you need link additions or removals on your watches, My Jewelry Repair has an easy, online, mail-in process that solves all your problems. Our process makes perfect sense after the holidays because we’re pretty sure that everyone is tired of dealing with the mall and department stores in general by this time of year. Post-holiday gift reparations are nothing new to us, either. We’ve even taken care of customers who’ve gotten their engagement rings in the wrong size, for instance, not to mention watches and any other type of jewelry. Don’t sweat it. In 2017, there was a Mastercard-SpendingPulse survey that showed a nearly 6% increase in holiday jewelry sales. The same survey showed a surge in jewelry sales the week before Christmas. That means many people save their jewelry purchases for last, which might make people more prone to making a mistake or purchasing something of the wrong size, whether it be a watch, ring, bracelet, etc. Jewelry retailers in general saw an increase in sales last year and expect the same this year, many of which increased sales over 10% according to a Centurion survey of upscale jewelers. Statista asserted that December of 2017 was the most popular engagement month as it held a 16% share of those surveyed, with May and July its closest competitors at 9% each. Christmas Eve and Christmas Day make up two of the top 5 most popular days for engagements as well. Did you know that the most common ring size for women is size 7 and men size 10? However, not everyone fits this mold. Some people are tricky to shop for. That’s where My Jewelry Repair is of distinct service. If you got the size wrong, we’ll help you save face and you can take all the credit. You don’t even have to step foot inside of that stuffy, poorly-lit mall to get the job done. We have a simple online, mail-in process that you won’t have to fuss over. If you’re feeling the holiday burn, you can join in on this one, too. Book an hour or more on the table for you and a special someone, or even a close friend. It’s a great way to unwind and spend some quality time after a stressful holiday season. 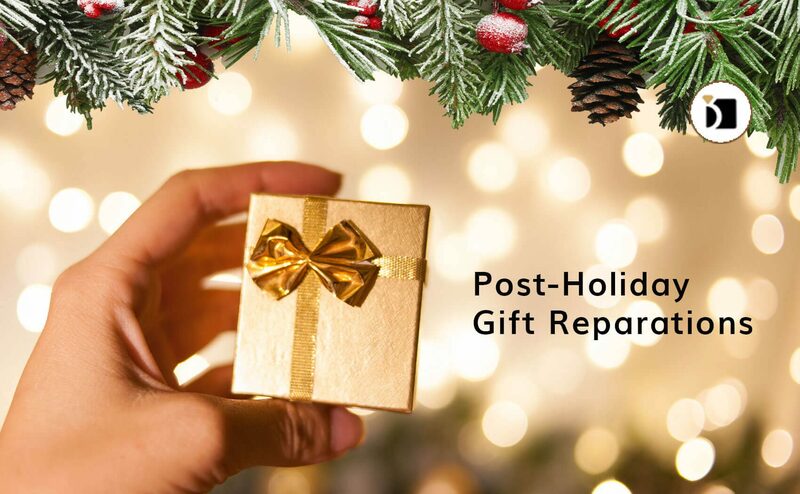 If you’re in need of some post-holiday reparations when it comes to jewelry and watches, we’re here to fix any problem you have in that department. Visit MyJewelryRepair.com today to take a look at our easy online, mail-in process.